The Apple Pippin is an open multimedia technology platform, designed by Apple Computer, and marketed as PiPP!N. According to Apple, Pippin was directed at the home market as "an integral part of the consumer audiovisual, stereo, and television environment." For more details on this topic, see Apple Bandai Pippin. On December 13, 1994, Apple announced the Pippin platform in Tokyo, as well as the partnership with Bandai. 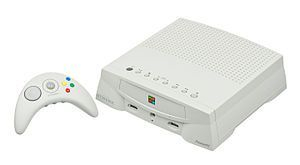 In March 1996, the white-colored Bandai Pippin ATMARK (ピピンアットマーク Pipin Attomāku) went on sale in Japan at a price of 64,800 yen, which included a dial-up modem and four bundled titles. Yamashina predicted 200,000 Pippin ATMARK systems would be sold in Japan within the first twelve months. Bandai originally planned to launch the Pippin in 1995, but the release was later pushed back to March 1996 for Japan and June 1996 for the USA. The black-colored Bandai Pippin @WORLD (pronounced at-world) went on sale in the United States in June 1996 at a price of US$599.00. The @WORLD bundle included a six-month unlimited Internet account from PSINet at a cost of US$24.95 per month. Bandai predicted 200,000 Pippin @WORLD systems would be sold in Japan in its first twelve months, and 300,000 systems sold in the USA within twelve months of being released there. By 1997, the Bandai @WORLD was extremely unpopular in the United States. Bandai pulled the @WORLD out of the American market, and shipped the unsold units back to Japan. The black-colored units were re-branded ATMARK (without the ATMARK labeling on the front) and sold in the Japanese market. For more details on this topic, see Network Computer. In May 1996, PC Graphics Report interviewed a Japanese executive associated with Bandai.] According to the article that documented the interview, attempting to market a gaming console as a computer was a sign of lack of cultural research on the part of the Japan-based Bandai. In particular, computer illiterate people did not know what an "@" sign was, as in @WORLD. Consumers in America could not grasp the idea of surfing the Internet using such a device. The executive could not understand how Americans might not be interested in surfing the Internet. Even among internet surfers, the Apple Pippin was not necessarily the console of choice. A July 1996 article in Electronic Gaming Monthly pointed out that the competing Sega Saturn and its separately sold Netlink device combined still cost under $400, making it a far less expensive internet option than the Pippin. [ And, any device that wasn't simple to use would be a failure in the U.S. market. NVRAM 128 KB NVRAM accessible storage space. Video Output VGA, S-video, RCA composite video (NTSC/PAL switchable), with 640x480 resolution, 8-bit and 16-bit color.